sink with waterFarmhouse, triple bowl, vessel… those aren’t names of skateboarding tricks or ski runs. Weirdly enough, they’re sink designs! When it comes to home design, people may think of everything but the kitchen sink. But that’s too bad, because there’s lots of funky potential that makes your sink more than just a holding tank for dishes. We’ve scoured the internet for awesome kitchen sink designs and we’re excited to share our findings. It doesn’t seem they’ll ever run out of cool kitchen sink ideas. This is the kind of sink that makes you wish you were 20 times smaller, just so you could take a dip into a tap water pool! 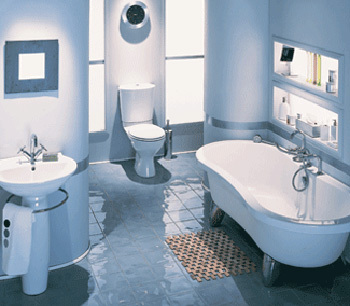 This serpentine style, guaranteed to start conversation in your kitchen, was found over at DesignerPlumbingOutelet.com. This copper undermount goes great with camouflaged kitchens. You know, the ones with the wooden fridges and whatnot. Or it can just act as an unassuming rustic accent. It may not be the most practical, however, as everything has to go in one bowl with no separation. This three-bowl kitchen sink is perfect for the super-organized, detailed types who like to keep everything in order. We like the unusual black color and the not one, not two, but three, sections! This enchanting sink is hardly a kitchen utility – it’s the kitchen centerpiece! Imagine the character this will give your favorite room (we’re assuming the room with the food is your favorite). New visitors might try to pick this sink up, so give them a little warning as you show them around the house. This is not a bowl; it’s true-blue, heavy duty wood sink. This twist on the practical stays pretty and stylish. It’s sleek, modern, and lots of other great adjectives that make it not-your-ordinary sink. If I had a nickel for every time I wanted to combine my cutting board with my sink, I’d have no nickels. But for someone out there, this sink is a dream come true. It’s also above-the-surface, which is weird, but in a cool, sophisticated kind of way. This is a three part post that discusses toilet repairs, which for the most part, are relatively easy for the average homeowner to perform. The main components are the fill valve, tank lever, and flapper. These parts are essential to the proper operation of the toilet. Today I will address replacing the fill valve. The replacement of the toilet’s fill valve is generally an easy task. The first step in the process is to secure the incoming water to the toilet tank. Once this is done, remove the tank lid, and put it in a safe place. Tank lids vary by manufacture and can prove to be costly when they are broken! Now, hold the tank lever down and open the flapper letting as much water exit the tank as possible. Once the toilet tank has drained, remove the excess water with a sponge or shop-vac until the tank is dry. Next, remove the supply line from the fill valve. After the supply line is removed, remove the shank nut from the fill valve. Now you should be able to remove the fill valve from the tank. There are a variety of different fill valves available. As a rule of thumb, take the fill valve you are replacing with you to your local hardware or home improvement center. An assistant should be able to provide you with an adequate replacement.